Are you looking for a great low-carbohydrate chicken recipe? Would you like to know how to prepare a quick and easy chicken recipe that will make your family and friends think you are a superstar in the kitchen? 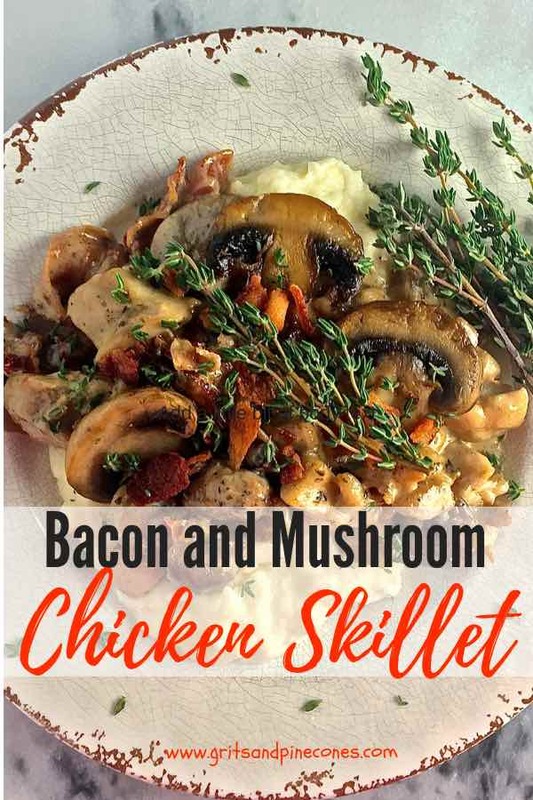 Well, hold on to your spatula, because Bacon and Mushroom Skillet Chicken is all that and more! Have you ever wondered just how many chicken recipes there are in the world? I set out on a search to find out but sadly I couldn’t find an exact number. The website Allrecipes alone lists over five thousand. So, I think I can safely say that worldwide chicken recipes must number in the tens of thousands. I know at our house we have chicken several times a week, prepared lots of different ways, and I’m always on the lookout for new and easy chicken recipes. But as much as we like all of the other chicken dishes I make, this recipe for yummy bacon, mushroom, and thyme chicken is one of our all-time favorites, and I know your family will love it too. Bacon and Mushroom Skillet Chicken is the perfect dish! This skillet chicken thigh recipe is quick, it’s easy, you only have to use one pan, and it’s delicious. Plus, not only is it great for busy weeknight family dinners, but it’s also perfect company fare too! And the best part, you can have it on the table in less than 30 minutes. Just the name alone should peak your interest. I mean really, bacon, what’s not to love? And mushrooms, is there anything better? And chicken thighs, well, enough said! 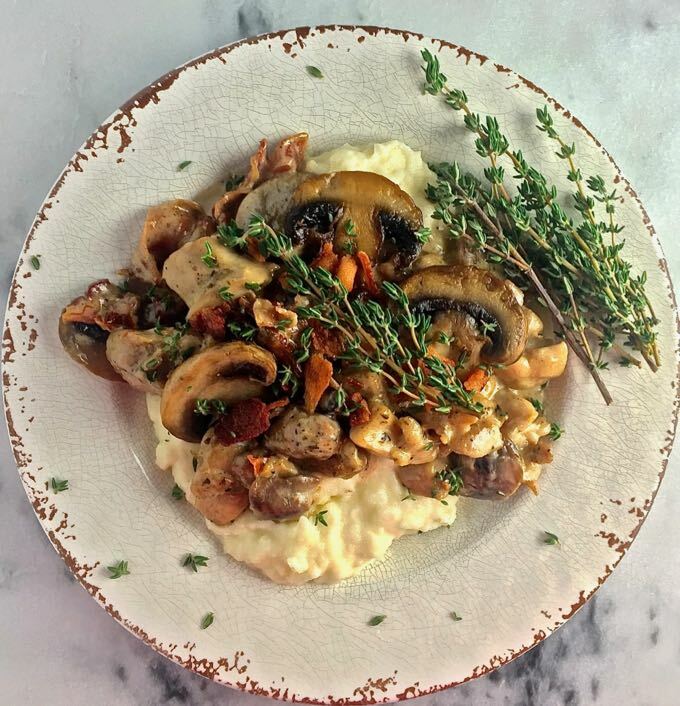 But wait, as if it couldn’t get any better, combine the bacon, mushrooms, and chicken with a rich, creamy, decadent sauce made with heavy cream and well, you get the idea! Is your mouth watering yet? 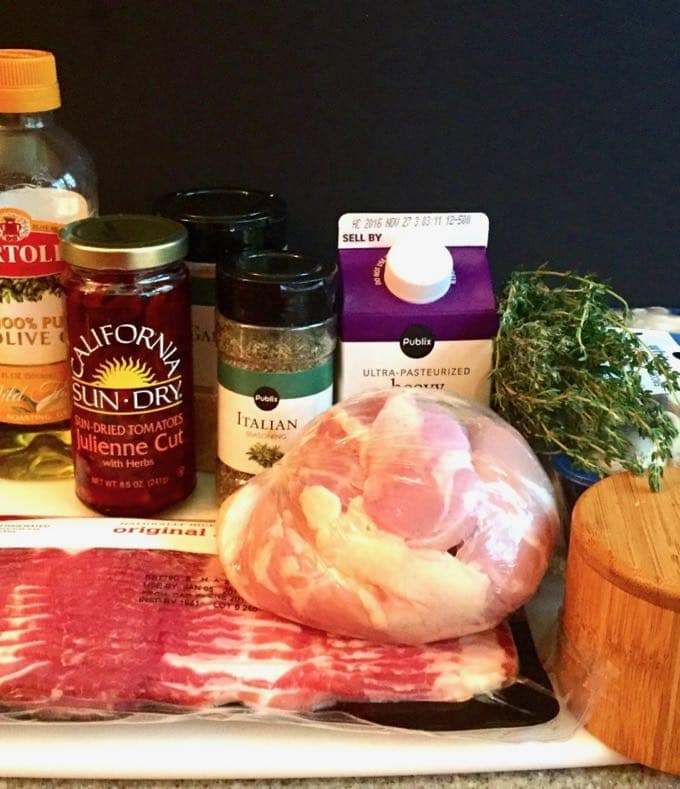 What to serve with Bacon and Mushroom Chicken Skillet? 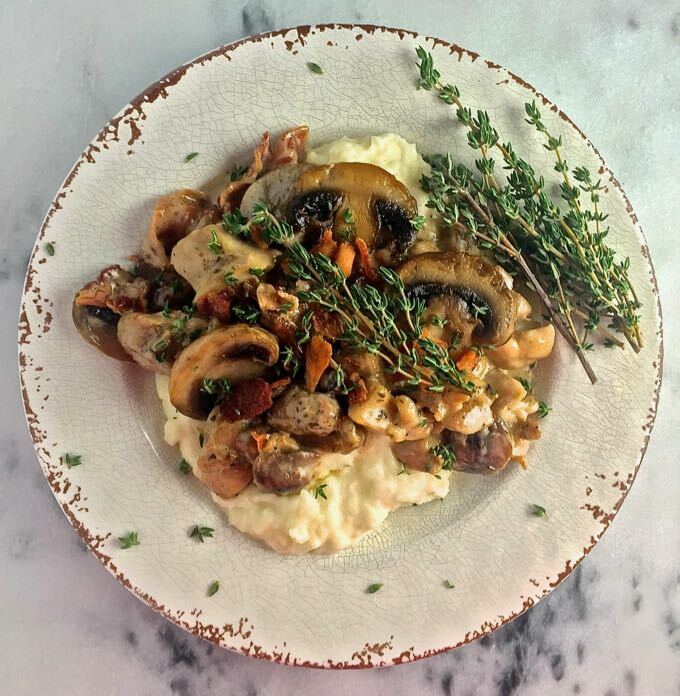 I usually serve Bacon and Mushroom Chicken Skillet over my Creamy Make-Ahead Mashed Potatoes, along with a salad, and can I just tell you it is scrumptious! We are having the leftovers tonight, and I can’t wait! And, yes, the leftovers are just as good the next day! 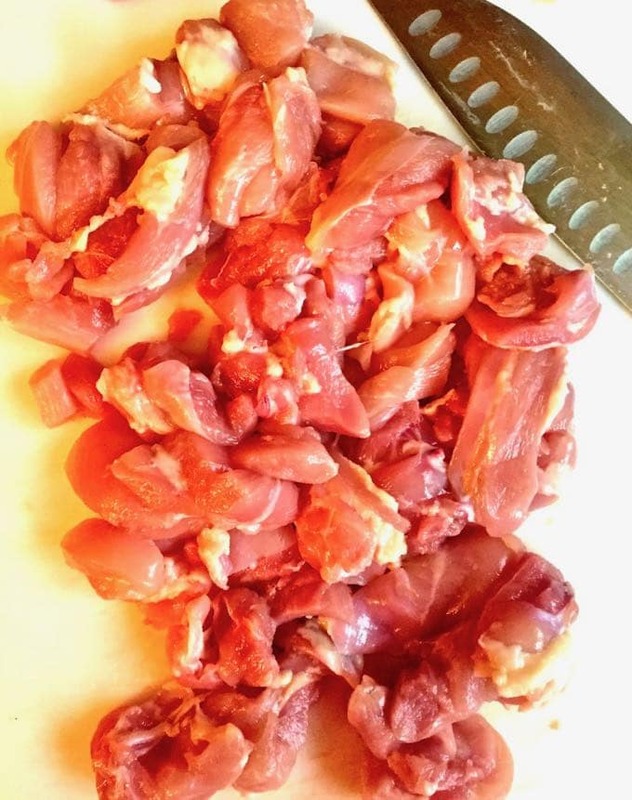 Can you substitute boneless, skinless chicken breasts for the chicken thighs? Of course; I prefer dark meat myself, but my husband prefers white meat. Either works well in this easy chicken recipe. 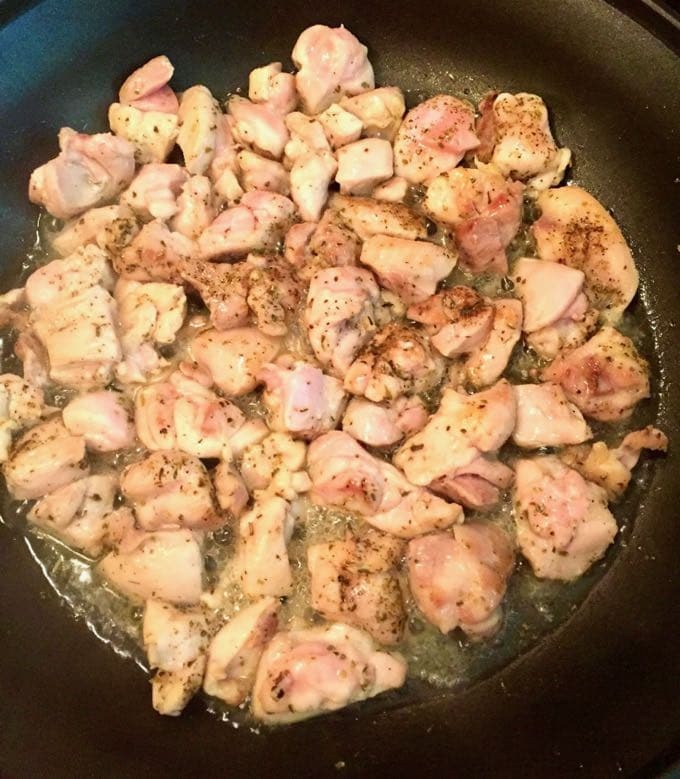 Step by Step directions with photos to make Bacon and Mushroom Skillet Chicken! Season the chicken with salt, pepper, and Italian seasoning. Add the mushrooms to the same pan in which you cooked the chicken. Stir and cook until they are tender, which should take about 4 minutes. Add the bacon, thyme, cream, salt, pepper, and garlic powder. Bring to a simmer and cook for a minute or two until the sauce starts to thicken just a bit. Add the chicken back to the skillet and cook just until the chicken is heated back through. To serve, garnish with sprigs of thyme. Enjoy! If you like easy chicken recipes, you might also be interested in these other popular recipes on my blog: Chicken Marsala, Lemon Chicken, Broiled Chili Rubbed Chicken Thighs, and Chicken and Broccoli Stir Fry. Need more inspiration, click here to view all of my chicken recipes. If you make this recipe, please rate it and leave a comment below. I love hearing from you! Also, please follow me on Pinterest, Facebook, and Instagram. *This recipe was originally published October 10, 2016. Rewritten and republished today with new photos, and additional tips. It is a perfect dish! It's quick, it's easy, you only have to use one pan, and it's delicious. Plus, not only is it great for busy weeknight family dinners, it's perfect company fare too! And, you can have it on the table in less than 30 minutes. Sprinkle salt, pepper and Italian seasoning over the chicken. Heat a large skillet over medium-high heat. Add olive oil. When the oil is hot, add the chicken and saute 3-4 minutes on each side or until the chicken is cooked through. Remove the chicken from the pan and set aside. 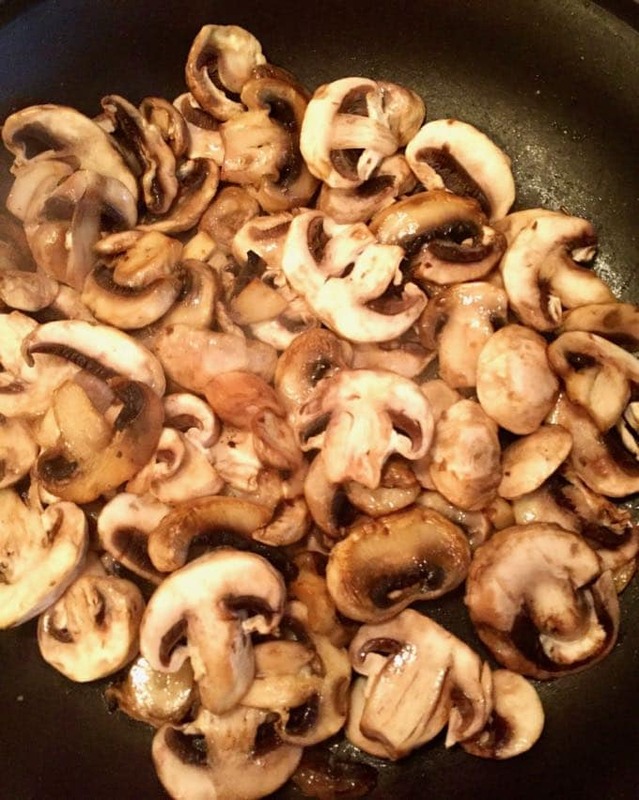 Add the mushrooms to the same pan in which you cooked the chicken. Stir and cook until they are soft which should take about 4 minutes. Add the chicken back to the skillet and heat for another minute or so. Garnish with the sprigs of thyme. Serve immediately. Enjoy! I usually serve Bacon and Mushroom Chicken Skillet over my Creamy Make-Ahead Mashed Potatoes along with a salad. You could also serve it over rice, orzo or quinoa. Leftovers are just as good the next day. You can substitute boneless skinless chicken breasts for the chicken thighs. Either works well in this easy recipe, but the white meat will not be quite as juicy. You can substitute one teaspoon of dried thyme for one tablespoon of fresh thyme. We really enjoyed this easy and tasty dish. I used chicken breasts since I had them and added a splash of white wine to the sauce. It was just as good re-heated for a second meal for the two of us. Thanks, Sharon, for a great low carb recipe. I’m so glad you enjoyed it and hope you guys are doing well! My husband and I really enjoyed this delicious and easy chicken dish. I followed the recipe to a T! I served it over orzo because that is what I had on hand. I am planning on heating up leftovers for tomorrows dinner. It was super easy and yummy. Thanks so much for sharing this recipe. Thanks so much for letting me know you enjoyed this dish. It is one of our favorites too! I usually serve it over mashed potatoes, but my husband loves orzo so I’ll have to try that next time!